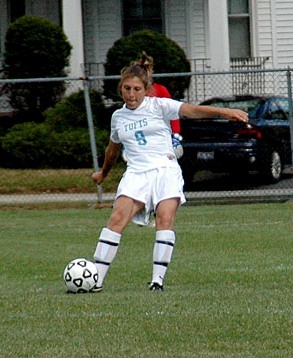 MEDFORD -- Sophomore forward Cara Cadigan (Nahant, MA/Swampscott) has been a Player of the Week candidate for the Tufts University women's soccer team in all five weeks of the 2007 season so far. On Monday, she earned her second New England Small College Athletic Conference (NESCAC) award of the season. In challenging home games for the Jumbos against Brandeis on Wednesday and Bowdoin on Saturday of last week, Cadigan scored three goals with two assists for eight points. She scored two first-half goals against Brandeis, the eighth-ranked team in New England last week, giving the Jumbos a 2-0 lead early and tying the score at 3-3 after the Judges had come back to take the lead. Cadigan eventually assisted on the game-winner scored by senior co-captain Martha Furtek (East Falmouth, MA/Falmouth) with just 1:40 left on the clock. Against Bowdoin, #6 in last week's New England poll, she scored to give the Jumbos a 2-0 lead in the 28th minute and then assisted on the final goal of a 4-1 win. Cadigan has scored in eight of nine Tufts games this fall, accumulating 10 goals and four assists for 24 points. She leads the NESCAC with 2.67 points per game, 1.11 goals per game and is tied for fourth with 0.44 assists per game. She currently has a seven-game goal-scoring streak, including two goals in the games against Brandeis and against Carthage on September 16. In all she has scored half of the Tufts University's 20 goals. She earned her first NESCAC Player of the Week award for the season on September 17. Tufts defeated eighth-ranked and #1 in New England Middlebury College in the second overtime period on September 15, 2-1, and then posted a 2-0 victory against Carthage College from Wisconsin on September 16. Cadigan figured in all four goals of the weekend, scoring the overtime winner against Middlebury and both goals against Carthage. The Jumbos, coached by Martha Whiting, were ranked #3 in New England and #17 in the nation last week. They have now won seven straight games after a 2-0 loss at home to Wheaton on September 11. They are tied atop the NESCAC standings with Williams College, which sports records of 11-0 overall and 6-0 in the NESCAC.